Clams casino is a recipe that's been around since the turn of the 20th century, and with good reason. With bacon, buttery breadcrumbs, and tender, juicy clams, it's filled with delicious flavor in every bite. Classic clams casino contains bacon, breadcrumbs, bell pepper, clams, butter, and herbs and spices. This classic recipe can easily be varied to suit individual tastes or dietary restrictions as well. This recipe serves six. Submerge the clams in a bucket of fresh, cold water for 30 minutes. Drain the water. Submerge again, repeating until there is no sand in the bottom of the bucket. With a brush, scrub the clams under running water. In a large skillet, cook 6 ounces of the bacon on medium-high until it is crisp, about five minutes. Remove the bacon from the fat in the pan with a slotted spoon and set it aside on paper towels to drain. Add the breadcrumbs to the fat in the pan and cook, stirring or tossing until golden, about 3 minutes. Transfer to the bowl with the bacon and season with 1/2 teaspoon of the sea salt and 1/8 teaspoon of the black pepper. Set aside. In a large pot, cook the remaining 2 ounces of bacon on medium-high until it is crisp, about five minutes. Add the onions or shallots and cook until they are soft, about five minutes. Add the sherry, red pepper flakes, smoked paprika, and clams. Bring to a simmer. Cover and cook on medium-low until the clams open. As the clams open, remove them from the pot with tongs and cool them in a bowl. Remove the lid from the pot and turn the heat up to medium-high. Cook, stirring until the liquid evaporates. Be careful you don't burn the bacon and vegetables. When the liquid has evaporated, cool the bacon and the shallots. In a bowl, mix half of the cooled breadcrumbs, cooled shallots and bacon, parsley, and the remaining 1/2 teaspoon of salt and 1/8 teaspoon of black pepper. Mix well. Pry the top shells from the clams (a butter knife should work for this - wrap your hand holding the clams in a towel to protect it). Place the clams open side up on a rimmed baking sheet. Spoon the breadcrumb mixture into the clam shells on top of the cooked clams, packing it tightly and mounding it. Sprinkle the remaining breadcrumb mixture over each of the clams, pressing gently to set it. Bake in the preheated oven until the butter melts and the clams warm, three to five minutes. Serve immediately. If you have celiac disease or a gluten-sensitivity, you can replace the panko with gluten-free breadcrumbs. Replace the sherry with dry white wine, such as chardonnay or pinot grigio. Turn up the heat by adding 1/2 teaspoon Sriracha to the liquid in step 9. Add 1/2 teaspoon of grated orange or lemon zest to the cooking liquid when you add the clams. Add 1 bell pepper of any color, finely chopped, when you add the shallots. Replace the parsley with an equal amount of chopped fresh basil, chopped fresh thyme, or chopped fresh cilantro. 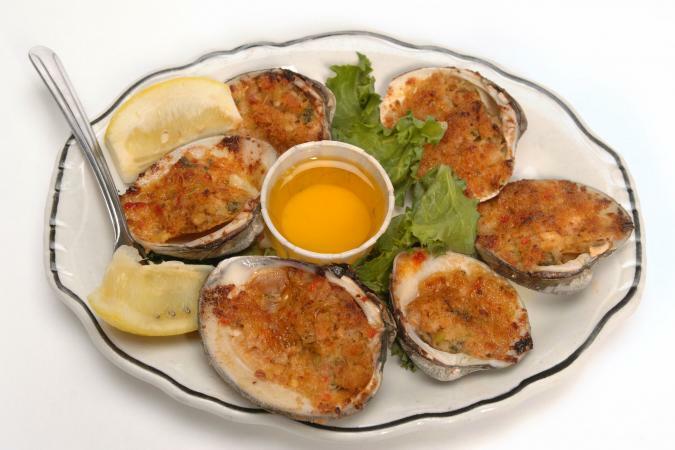 Clams casino is a tasty appetizer or main course. If you're making it a main course, you'll need melted butter and lemon on the side. You can also serve it with a salad of simple greens dressed with balsamic vinaigrette or cooked asparagus. Clams casino has been popular for a long time, and it's easy to see why. This classic seafood dish makes an excellent meal or appetizer.